Above: A selection of flavors from Whoo&apos;s Donuts, in Santa Fe. Photographs by Douglas Merriam. SOMETHING ABOUT FRIED dough activates the primitive pleasure sensors of our lizard brains. Tell me this hasn’t happened to you: Someone walks into your office and raises the lid on a dozen still-warm glazed doughnuts, and you sincerely say, “No, no, I couldn’t.” Then you smell them and suddenly you’re watching your hand bring one in for a bite and hearing Homer Simpson’s voice coming out of your mouth: Mmm … doughnut. We New Mexicans will always be loyal to our homegrown deep-fried favorites, sopaipillas and fry bread. But we’re also digging a group of New Mexico bakers who are joining the nation’s artisanal doughnut movement, using local ingredients, infusing the beloved pastries with familiar flavors, and decorating them with cultural touchstones. 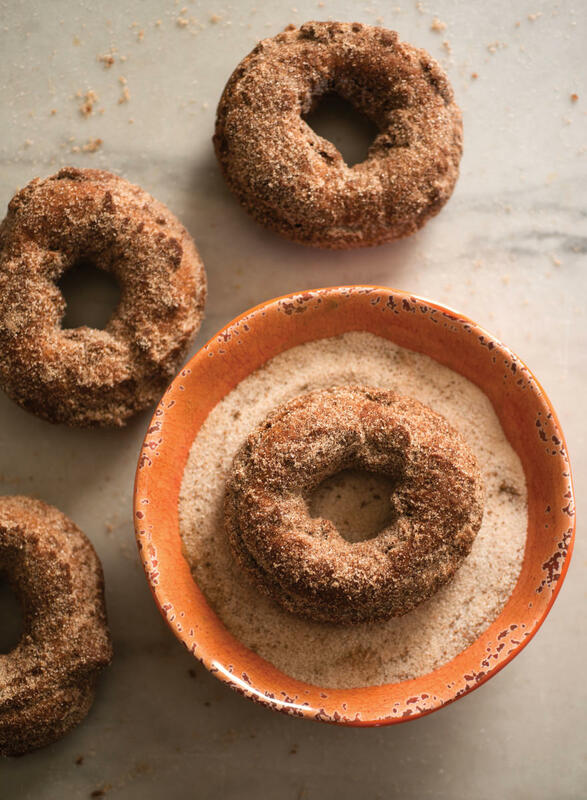 Doughnuts rose to fame as snacks cooked in the field for soldiers in World War I, and their popularity has endured for a century, through boom times, recessions, and health crazes. (Just FYI: One glazed doughnut has fewer than 200 calories, while a plain bagel has about 250.) Warm, sweet, comforting, inexpensive, and omnipresent, doughnuts have outlasted flashier trends and fads. Good, basic doughnuts abound throughout New Mexico. But in Albuquerque and Santa Fe, a handful of shops are thriving by expanding the standard fried pastry palette. Whoo’s Donuts, in Santa Fe, now sells its iconic blue-corn blueberry lavender doughnuts (and nine other flavors) in 10 coffee shops and grocery stores across central New Mexico and in Whole Foods stores in seven states. Albuquerque’s Rebel Donut opened a second location and continues to build on an adventurous, unconventional menu of doughnut decorations, including potato chips, fortune cookies, chocolate “dirt,” and gummy worms. The success of those shops opened doors for ambitious startups like Albuquerque’s Bristol Doughnut Company, which is earning buzz with a unique brioche-like dough. 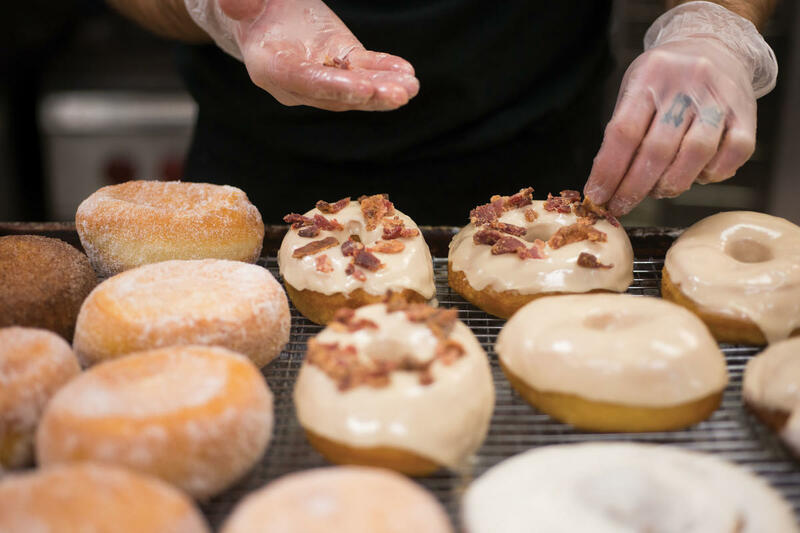 Above: Bristol&apos;s maple bacon doughnut. Creative doughnut shops across the country have learned to harness the power of social media to locate hip, hungry customers and deliver them to the bakery case. New Mexico’s shops are no different. Bristol Doughnut Company had nearly 1,000 followers on Instagram after being open only a few months, and owners Coy and Sara Trammel found their first employee when she showed up, smartphone in hand, eager to try the salted-butter glaze she’d ogled online. The more established Rebel Donut has 22,000 Facebook followers who exalt over the latest, wildest designs, from the Barney Rebel, decorated with Fruity Pebbles, to the Homer Simpson, slathered with the pink icing and rainbow jimmies of Homer’s drooling dreams. On Facebook, Whoo’s legions of fans virtually drool over the New Mexico–inflected flavors of its green chile apple fritter, the glazed ring topped with red chile bacon and toffee, and the special bizcochito-flavored cake doughnut. After spending several days eating my way from shop to shop (tough job, right? ), it occurred to me that each one seems to have captured and magnified certain personality features of the city it serves. A VISIT TO WHOO&apos;S has become an essential stop on any visit to Santa Fe. Most tourists discover the doughnuts at the Santa Fe Farmers’ Market, where they usually sell out. Whoo’s is popular with locals, too, although the City Different operates on its own time. “In Chicago or New York, there’s a line out the door at 5 a.m., but in Santa Fe there’s a rush at 10:30, after yoga class,” I learn from Jeff Keenan, who, with his wife, Keri, also owns Chocolatesmith, next door. People who come to Whoo’s aren’t just looking for a doughnut. They’re looking for a food experience, one they can photograph, hashtag, and Instagram before they devour it. And although there is a Dunkin’ Donuts around the corner and a Krispy Kreme down the road, they aren’t competition, Jeff tells me on a slow afternoon during which I say I don’t want a doughnut and then inhale an entire blue-corn blueberry lavender. “Our sales didn’t change when the Krispy Kreme opened here,” he says. “In fact, nothing happened.” Even though Whoo’s doughnuts cost up to three times as much as a Krispy Kreme, the shop’s sales in January, typically a dieting month, were up 27 percent from the year before. 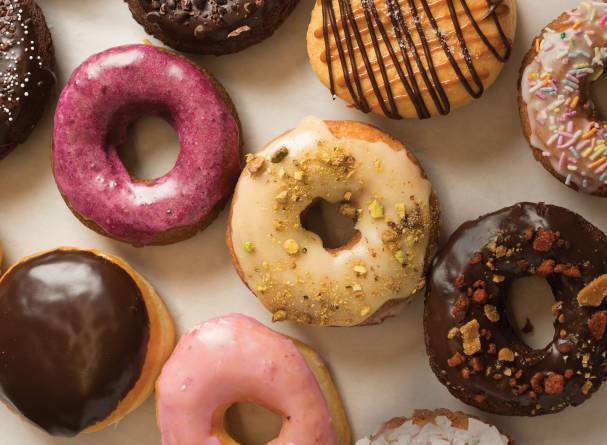 Above: Get your doughnut fix at one of two Rebel Donut locations in Albuquerque. That’s in part because of Whole Foods. The Keenans embarked on their doughnut journey back in 2011 with very specific goals. Chocolatesmith had already negotiated a contract with the natural-foods chain, so they knew Whole Foods’ stringent requirements. Every ingredient is GMO-free, and the muted color palette testifies to the exclusive use of natural food colorings. Although they ship tens of thousands of doughnuts per month, each batch flash-frozen to be defrosted in-store, the little shop on Cerrillos Road feels like a neighborhood joint. And the doughnuts exude local pride. The white chocolate lemon pistachio is made with nuts from Heart of the Desert, in Alamogordo, and the maple blue-corn pecan uses organic nuts from Del Valle, in Las Cruces. The Keenans’ big goal is to make blue-corn doughnuts ubiquitous in the Southwest. “I would feel accomplished if, when people come here, they’re like ‘You have to try the blue-corn doughnut,’” Jeff says. ON THE FRIDAY MORNING I stop in to Rebel Donut’s original location, on Wyoming Boulevard in Albuquerque, folks are streaming out the door, each hefting a dozen. Or two. Inside, owner Carrie Mettling fills boxes at the counter, then darts into a back room to decorate enough doughnuts to replenish the display case. Trained as an architect, Mettling founded the boutique cupcake shop Cake Fetish in 2006, but sold it before opening Rebel in 2012. I watch as she uses her drawing skills to embellish simple doughnuts with wild designs, pulling out one clear plastic pastry bag after another and applying a kaleidoscope of dots, swirls, and curlicues to a dozen skull-shaped doughnuts. 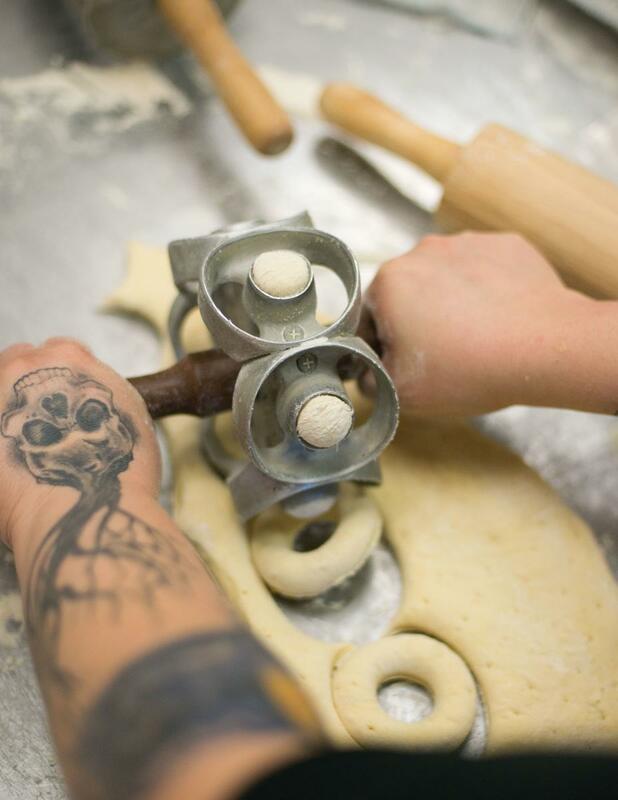 Above: Punching dough at Rebel Donuts. Rebel’s style captures the youthful, sassy attitude that its name promises. I eavesdrop as Andrea Zamora Silva takes phone orders for a new Valentine’s Day gift called the Chola-gram: $40 buys one dozen doughnuts and a personalized rap or short poem delivered by “Lil’ Baby Dreamer,” a satirical character that Zamora Silva, a Rebel employee and aspiring comedian, created years ago with a series of YouTube videos. Her announcement went viral on Facebook and she sold out, with three solid days of deliveries. The idea so amuses me that I order one for my husband on the spot. I make sure his dozen includes at least one Blue Sky, a signature Rebel doughnut that pays homage to the Emmy-winning show Breaking Bad, filmed in Albuquerque. Mettling dips vanilla cake doughnuts in pale azure glaze and studs them with nuggets of a color-matched rock candy that looks a heckuva lot like the show’s mythical blue meth. 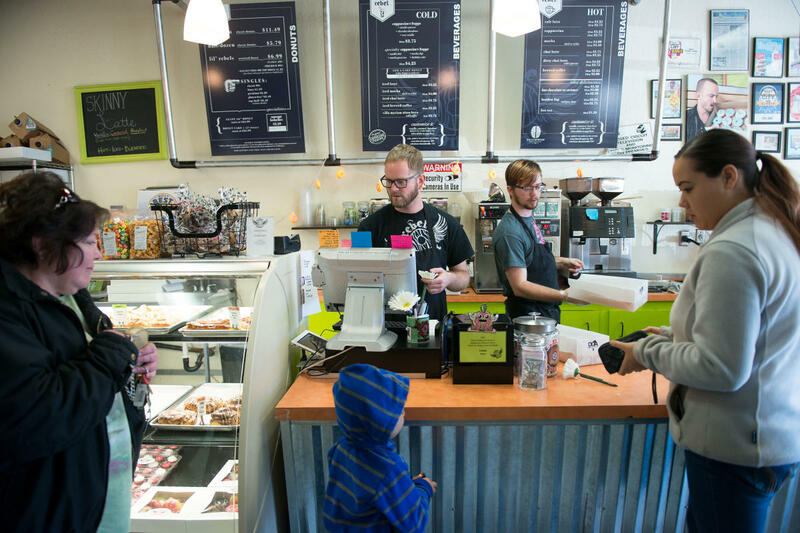 Bristol is one of the many entrepreneurial micro-shops that share Spur Line’s expansive warehouse in Albuquerque’s up-and-coming Sawmill District, near Old Town, but it is the only one emanating the tantalizing aromas of fresh doughnuts and hot coffee. Snaking my way toward the back of the building, I look for Bristol’s unusual display case: the rear end of a vintage Datsun, painted flat black, a detail I had noticed on Instagram. The Datsun’s back glass showcases a small selection of gorgeous doughnuts. The Trammels make just a few dozen most days, but more on Saturdays, when they deliver the extras to sell through Little Bear Coffee, in Albuquerque’s Northeast Heights. Earlier this morning, I met the couple at the South Valley Economic Center, a community kitchen where they make their doughnuts—and get valuable business advice. At 6:30 a.m., it was still dark and the building was deserted, but the Trammels had already been there long enough to get set up. Each morning, they make a batch of dough they’ll use the following day, then pull out yesterday’s perfectly risen dough, shape it, and fry it. Sara developed the yeast-based recipe, a rich and buttery brioche dough that’s more dense and less sweet than you may be used to. The salted-butter-glazed ring rushes the taste buds with waves of sweet and salty. The Bombolino, a disk that’s as big as a linebacker’s palm, oozes ridiculously indulgent tiramisu-flavored cream. The Trammels opened their business in September 2017 and were in the kitchen, as usual, one morning in November when Sara realized she was going into labor with their third child. A dedicated small-business woman and an experienced mom, she finished making the doughnuts before heading to the hospital. With the help of family, the couple now juggles three kids and fills the Datsun with doughnuts seven days a week. If their success continues, the Trammels hope to fix up that old bus and get it on the road. “It’ll be just like an ice cream truck, but instead of kids chasing after it, it’ll be stay-at-home moms—it’ll be everyone,” Sara says, laughing.